The new water tower is just the cherry on top. 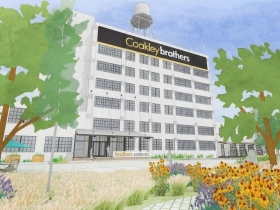 Coakley Brothers Complex. Photo by Jeramey Jannene. 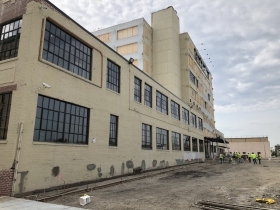 An oft-overlooked Walker’s Point warehouse is becoming a guiding light in the south side neighborhood. 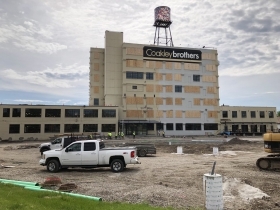 The 174,000 square-foot complex of buildings at 400 S. 5th St., which dates back to as early as 1911, serves as the headquarters for moving, storage and business services company Coakley Brothers. 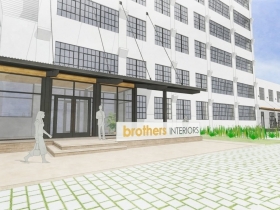 The firm has been in the complex for over 22 years and has recently seen tremendous growth from their Brothers Business Interiors line which focuses on interior renovation, furniture specification and move management. Artist Tom Fruin stands in front of the installed water tower. Photo by Jeramey Jannene. The company is in the home stretch of $6 million overhaul of the complex. Chief among those improvements is the installation of a 20-feet by 20-feet artistic water tower on the complex’s roof (see photos). Brooklyn-based artist Tom Fruin‘s Plexiglass and powder-coated steel water tower was lifted into place last September, and now the rest of the complex is catching up to its beauty. The Kubala Washatko Architects is leading the design on the redevelopment. Firm architect and project manager Joel Krueger is serving as the lead architect. 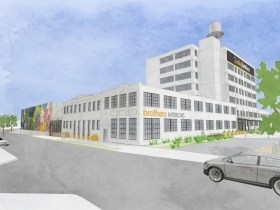 The architecture firm is no stranger to the area, having led design work on both the Iron Horse Hotel and Brix Apartments just north of the building. The Cedarburg-based firm, under the guidance of principal Chris Socha, also opened their TKWA UrbanLab just a few buildings south of the six-building Coakley complex last year. 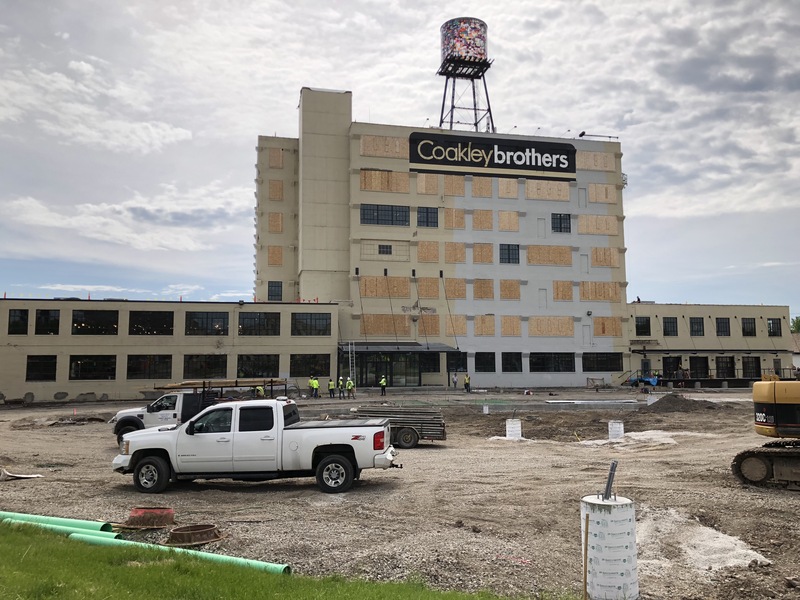 When the work is complete, the building will house 45,000 square feet of office space for Coakley, up from approximately 18,000 in its current configuration. Coakley is financing the project in part with historic preservation tax credits. 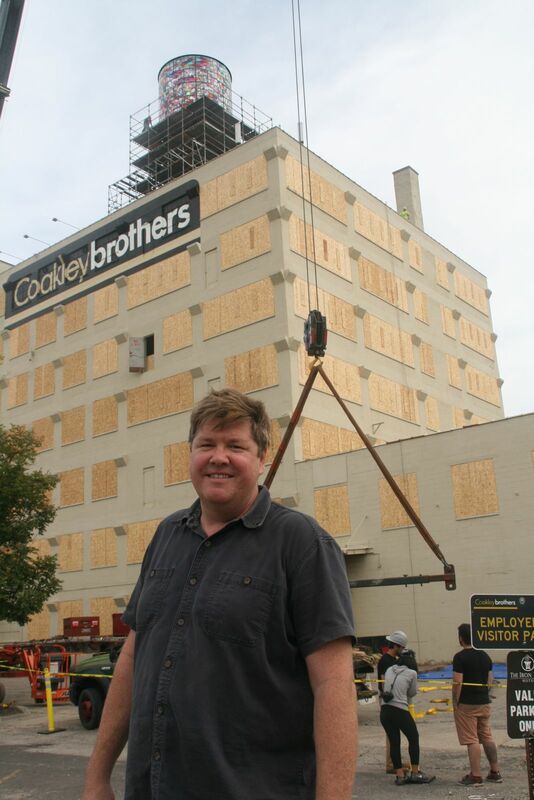 Coakley Brothers president Peggy Coakley told Urban Milwaukee in September that the firm employs approximately 140 people. The company assists a number of firms in relocations, including the Milwaukee Bucks. And while the company has long sported the Bucks’ logo on a number of its trucks, the water tower has also found its way into the company’s truck designs since the September unveiling. The firm also serves as the local agent for Allied Van Lines. 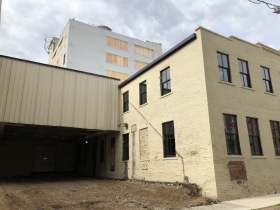 The overhauled building will also house the only showroom in Wisconsin for home furnishing retailer West Elm and its Workspace brand. Coakley will continue to use a portion of the building for client storage. 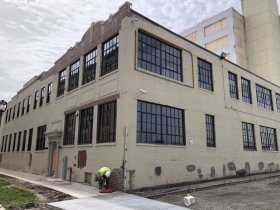 Kelly Construction & Design is listed as the project’s general contractor on city building permits. Firm president and CEO Peggy Coakley found inspiration for the artsy creation by chance on a trip to New York City. 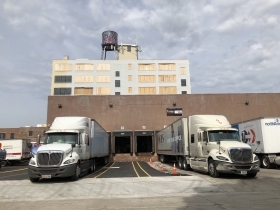 Getting into an Uber vehicle in Brooklyn’s DUMBO neighborhood, Coakley spotted an artistic water tower affixed to the top of a former warehouse. That water tower, about one-fourth the size of the one installed in Milwaukee, was designed by Fruin. The artist’s studio is inside the warehouse, and he had prudently offered the water tower to his landlord. Coakley didn’t disclose the price of the Milwaukee installation. Coakley, who describes the building’s location at the south end of 6th Street Bridge as “the gateway to Walker’s Point,” noted that her group had extensively debated what to do with the 40-foot-wide water tower base atop the building. While the water tower itself was long gone, similar to many other buildings in the neighborhood, the base remained as a vestige of the neighborhood’s industrial heritage. The colorful tower is lit at night. Be careful. The dolt who lives in the executive mansion in Madison once rejected free public art. (The infamous Blue Shirt incident). He’ll probably want a new law banning rooftop art. Was this the former Hack’s furniture store with the big yellow smiley face on the water tower? If so, I’m glad the building is being repurposed. 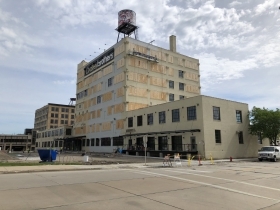 I’m also glad Milwaukee is preserving so much of its beautiful older buildings after the dark era of the 19060s and 70s when so many irreplaceable historic buildings were being torn down.